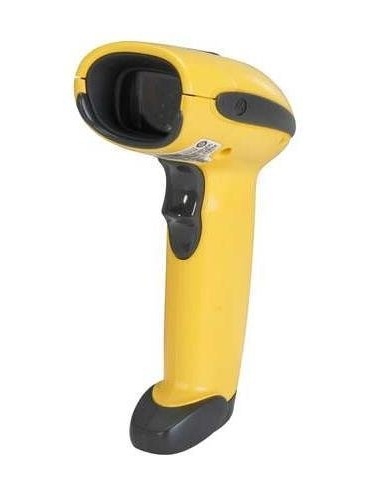 The perfect entry-level scanner for industrial applications the robust handheld scanner LS3008 offers performance and durability in production, logistics and light industry at an extremely attractive price. It was designed for operation under harsh industrial conditions and offers the highest service life in its category. IP53 certification and numerous interface and programming options make the LS3008 an all-round scanner for demanding applications. Scanners can accidentally fall onto concrete or similar hard surfaces, in particular under tough conditions. This poses no problem for the LS3008 its single circuit board design prevents problems when connecting between different circuit boards, a technology commonly used in scanner products of other manufacturers. Furthermore, the patented liquid polymer scanning technology is resistant against impacts, as well as against wear and tear. The lifetime warranty for the scan engine proves how confident Zebra is of this technology. A remarkable fact, considering it is an industrial scanner at such a competitive price. The durability of the scanner is IP53 certified and can withstand repeated drops from a height of 2 metres. Additionally, the scanner is equipped with a scratch-resistant scan window made of hardened glass to improve its durability. The IP certification for sealing against foreign particles proves that the device can be used in dusty conditions with a clear conscience. The scanner also has a seal that protects the housing against wear. Consequently, the scanner can easily be used in manufacturing facilities and hospitals that require high hygienic standards, as it can be disinfected with common means. Using the scanner is particularly convenient virtually no instructions are necessary to use this user-friendly, light and ergonomic device, which is packed with functions that increase productivity. The scanner reads objects from any angle thanks to its innovative multi-line scan raster pattern, which makes aiming at the bar code obsolete. This technology offers enormous advantages compared to conventional industrial scanners. The scanner reads all commercial 1D bar codes from up to 48 cm distance depending on bar code size and type. At the same time, the scanner can also read bar codes with a printing width of only 3 mm and decodes them without problems. The scanner is unaffected by ambient light, regardless whether from normal daylight or industrial and office lighting. Besides functions that increase user productivity, the LS3008 distinguishes itself with low purchase and operating costs. Its robust design reduces servicing time to a minimum. Using RSM support Remote Scanner Management, the devices can be configured and upgraded centrally, which lowers administrative costs significantly. Several integrated interfaces guarantee connectivity to every current and future host system. As even robust scanners require servicing, Zebra offers you the support contract Advance Exchange in its Service from the Start programme. With this extended warranty, a replacement is delivered on the following day to provide the best possible operating time and productivity. This special offer already includes the unique Zebra service Comprehensive Coverage, a service that covers not only normal wear and tear, but also damage caused by accidents to the scan elements, scan windows and all internal and external components - at no extra cost. This reduces unpredictable maintenance costs dramatically.